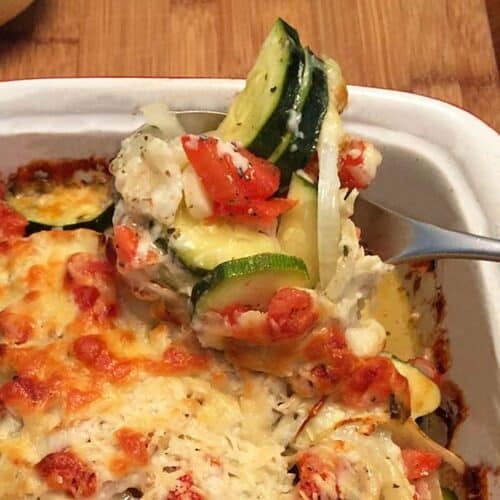 Get your zucchini on with this easy to prepare cheesy zucchini casserole. Slice up vegetables, season, grate some cheese and bake. That's it! 2 zucchini, washed & halved lengthwise then cut into slices. Preheat oven to 375 degrees. Lightly coat an 8x8-inch baking dish with olive oil. Prepare vegetables. Toss together with Italian seasoning and salt and pepper to taste. Place in prepared baking dish and drizzle a little more olive oil over vegetables. Cover with foil and bake for 30 minutes. Remove from oven, uncover, and sprinkle both cheeses over top of vegetables. Place back in oven and bake, uncovered, for another 30 minutes.